When I mention cloud computing to teachers I almost always get the deer-in-the-headlights look. It is the same look I would get when I started teaching adding fractions with unlike denominators to fourth graders. So what is cloud computing? My very simple explanation is this. Cloud computing is when you are working on a website or mobile app that stores your information on a website. Basically the information you give the app isn’t on your computer, phone or iPad. It is on a web server somewhere. So when we discuss using Dropbox or Google Apps, the files are not stored on your computer. Why would you want to store your information or files on someone else’s server? The answer is access. If I save a file to my Dropbox, I have access to the file on almost any device anywhere I have an Internet connection. In my district, the (local) desktop computers save our files on a school server. These files are only accessible when logged on to a school computer at one of our schools. If I want to take a file home to work on, I have to get it to another computer by emailing it to myself, saving to a USB drive, etc. Using a cloud drive like Dropbox, I save to the cloud folder and when I get home it is available on my home computer or iPad. Keep in mind that if you are working on a file in a specific application such as Microsoft Word, you need to have an application that can open and edit the file to make changes. Also keep in mind that if you use a font that isn’t on both computers, the fonts will change. Save to the cloud or not save to the cloud, that is the question! Only you can answer it. If you teach math, you have probably used geoboards. If your geoboards are like mine, the rubber bands have gotten old and brittle. Students seem to go through three or four in a lesson. Older students tend to shoot the rubber bands at each other. Geoboards are a great for teaching geometry. 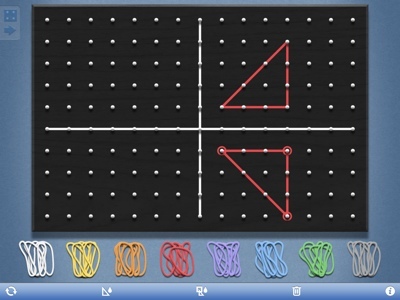 I recently taught transformations using the Geoboard app. Students were more engaged than ever. I didn’t have any rubber bands break or fly across the room. Using a projector, I was able to display my board for the students to manipulate to the other students to see. It is a simple app with great potential. If you have set a password or restriction code on your iPad, what happens if you forget what your password? If you set a password and turned on the erase feature, after 10 wrong attempts, the iPad erases the data. Even if you don’t set up the erase feature, you are still unable to use your device. Keep in mind you may loose some data and apps. You can reinstall your purchased apps from the app store. A piece of advice… back up your iPad regularly. From time to time I have students and teachers ask me for an alternative to MS Office. In this poor economic time, many students do not have $120 to spend on Word, Excel and PowerPoint. For years I have periodically used Open Office, but find myself returning to MS Office. My Mac and iPad have the iWork Suite. Again, I have tried to use these products more often. Again, I find myself going back. I have even tried using Google Apps, with the same end result. What I question inside my soul is WHY DO I RETURN TO MICROSOFT? 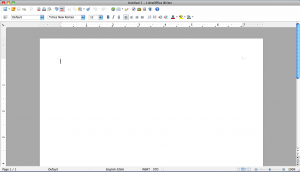 For the beginner and novice user, the alternatives to MS Word are wonderful. 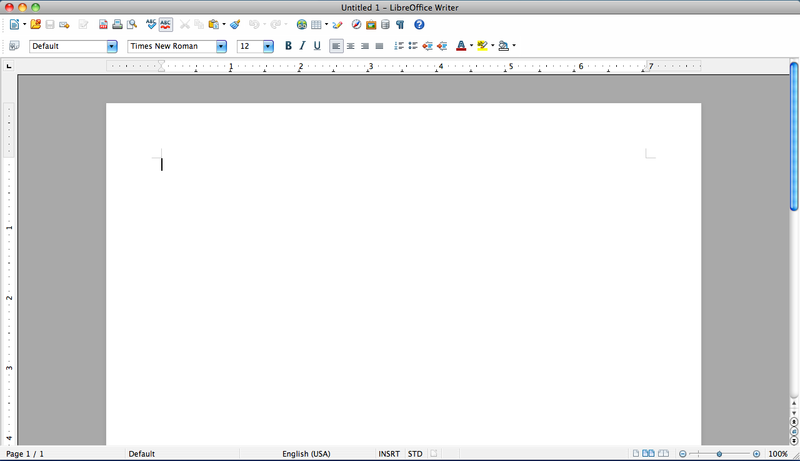 Open Office and another open source product I was recently introduced to, Libre Office, are more than enough. AND THESE APPLICATIONS ARE FREE! Yes you heard me correctly, Open Office and Libre Office are free open source products. Google Apps is free as well although there are a limited set of features. The iWork suite, Pages, Numbers and Keynote, which are $20 per application, are also great products for your Mac. For the more advanced user, I find some features are not available unless you are using MS Office. One such feature is the data merging from Excel to Word. This works very well and is quite simple. I did find this option on Libre Office, but the functionality is very limited. The other options either have little or no data merging feature. There are other features as well that I just haven’t found on other products. So which product should you choose? I can’t answer that question. It depends on what you need the application to accomplish. You need the right tool for the job. For most students, the free open source programs are more than enough to get through high school and college. My suggestion is to download Open Office or Libre Office and give it a try. If you need something more, take a trip to Walmart, Target, Best Buy, you name it, and pick up MS Office. Before you head out, don’t forget your wallet. MS Office isn’t free. If you have shelled out $500 or more for an iPad and another $50 or more for a case, you want to make sure your investment doesn’t grow legs and disappear. In the school environment, there are people in and put of my room all day. Although I lock things up when I am gone, there are times you must turn your back and walk away from your iPad. The Find My iPad feature works through the iCloud system. Start by going to settings > iCloud. Turn on the Find my IPad feature. 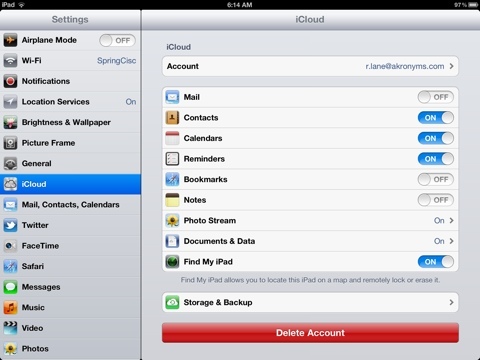 If you have not set up iCloud, it will prompt you to do this. Once you have this set up, from your Mac or Windows computer, go to www.icloud.com. From there you will be prompted to log in with your Apple ID and password. You can see where your iPad is located, lock the screen and send a message to display on the screen. Even if you haven’t lost your iPad, it is fun to play with this feature. A final note, you will receive an email informing you that the Find My iPad feature was used. Has this happened to you? You are typing away at your iPad only to find that several of your words are not even close to what you typed? It has happened to most of us. My guess is that you have auto correction function turned on. Now I happen to like this feature. It does require me to go back and proofread what I wrote, but it saves me time in the long run. 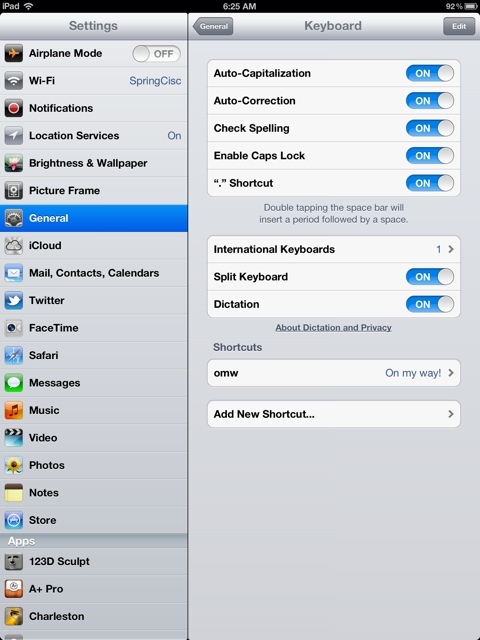 To disable this feature, go to Settings > General > Keyboard and turn off Auto Correction. That should do the trick. Having had the opportunity to have had each of the three iPads, I would like to weigh in on the discussion about the iPad 2 verses the New iPad. I just got my new iPad last week and I already love it! I continue to be amazed at what the people at Apple can create. Enough with my love affair with the iPad, let’s get to some real practical comparisons. My goal is to get you to think about which iPad is right for you. The iPad 2 has been dropped to $399 for the 16 GB wifi model. From what I have read, this is the only size you can order from Apple. I have found some other models at local stores. The New iPad starts at $499 for the 16 GB wifi model. The price goes up from there, raising $100 at each step for the wifi models. The display on the New iPad is very nice, but so is the display on the iPad 2. You can tell a difference between the two. The retina display is not enough for me to recommend the New iPad. I was very excited when I got my iPad 2 because it comes with a camera. I was disappointed in the fact that the iPad 2 camera is not very good. With plenty of light and a very still subject, the pictures come out okay at best. The New iPad has a 5 mp camera with auto focus. It is much nicer. You still need a still subject. Of course most people have a smart phone with a good camera. You have to decide if this option is important for you to take the step up. For me, if I want good quality pictures, I am going to grab my Cannon DSLR. Battery life is the same for both iPads. Even after using my iPad 2 for a year, the battery will last all day. The iPad 2 has the A5 chip and the New iPad has the A5X chip. I have found the New iPad to be slightly faster at typical tasks such as browsing the web. Of course this may be just my imagination. There is a new feature on the New iPad called Dictation. You can dictate into the microphone anytime your keyboard is shown. I have found the feature works very well. There is a disclaimer though. Basically, Apple records your voice to convert what you say into text. It sends information to Apple. Keep that in mind when deciding whether or not to use the dictation feature. Technically the New iPad is larger that the iPad 2. Realistically, the size and weight are only a little larger. You can’t tell a difference. I have only used the wifi models so I do not have the experience to discuss the difference in speed from 3G to 4G on either iPad. If you have been wanting an iPad, but haven’t wanted to spend the money, I would suggest trying the iPad 2. (Unless you have lots of disposable cash.) The difference for most users is not great enough to warrant spending the extra for the New iPad. On the other hand if you really use some of the new features such as the camera and dictation, I would suggest you purchase the New iPad. Overall you have to decide for yourself which is the best for you. Either way, I don’t think you’ll be disappointed. Welcome to my blog. This site was created as a way to organize many different elements I use to help teachers integrate technology into their classrooms. There will always be a place for integrating technology into the classroom. As new technologies are invented, it takes time before it is common place in the realm of education. It takes brave teachers who are willing to take the time and effort to learn about the new technology and find ways to use the technology to impact students. I am sure it took time before the movie strips were integrated into lessons. I can hear a teacher saying, “I could never work that thing. It is too complicated.” But someone saw the potential and tried it in the classroom. I am sure there were glitches and problems. Today videos are so common most people wouldn’t even think of not using a video to teach a concept. Of course today we stream our videos from the web or show a DVD. When I started teaching 16 years ago, I would never had dreamed that I would use a small 10 inch by 8 inch device as I walked around my room. But a day does not go by without me using my iPad for either classroom administrative tasks or instructional tasks. This blog is my way of helping teachers take small steps at using new technologies in the classroom. If you take it ONE BYTE AT A TIME you can be a pro at using these technologies with your students.